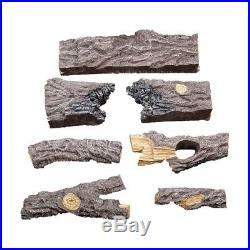 Vented Gas Fireplace Log Set Glowing Embers Heater Decorative Fire Rocks Warmer. The Emberglow 18 in. 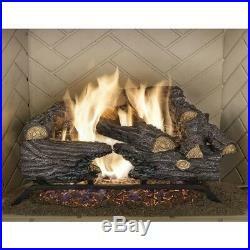 Split Oak Gas Log Set has an innovative dual burner that creates the most realistic dancing flames. Naturally stacked log design re-creates the look of a mature fire. This is a vented set so your chimney flue must be in the open position. Easily produces up to 50,000 BTUsAll logs are hand-painted for added beautyWorking chimney flue is required. 50,000 BTU’s with superior flame patterns. 7 highly detailed, hand-painted logs sit over a beautiful bed of glowing embers. Environmentally friendly; no ash, no wood splitting, no mess, no hassle. Requires a working chimney flue in the open position. Vented set operates on natural gas, it will require a safety pilot kit (item CVS-303) and vermiculite (item ACC18) to convert to operate on liquid propane. Vented log sets create as much heat as a real wood burning fire. Add optional accessory model RVS-304 for a safety pilot and remote control operation. Includes ash mix, glowing embers and gas connection hardware. Difference between vented and vent free. Easily produces up to 50,000 BTUs. All logs are hand-painted for added beauty. Working chimney flue is required. We stand behind our products. Our stock all ships from our US-based warehouses. Most orders are in transit for two days but some may take longer. 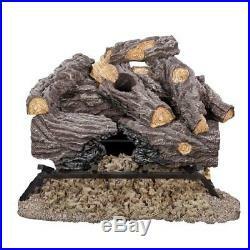 Vented Gas Fireplace Log Set Glowing Embers Heater Decorative Fire Rocks Warmer Easily produces up to 50,000 BTUsAll logs are hand-painted for added beautyWorking chimney flue is required 18 in. Split Oak Vented Natural Gas Log Set The Emberglow 18 in. 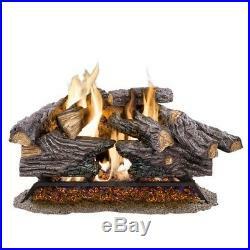 The item “Vented Gas Fireplace Log Set Glowing Embers Heater Decorative Fire Rocks Warmer” is in sale since Monday, March 19, 2018. This item is in the category “Home & Garden\Home Improvement\Heating, Cooling & Air\Fireplaces & Stoves\Decorative Logs, Stone & Glass”. 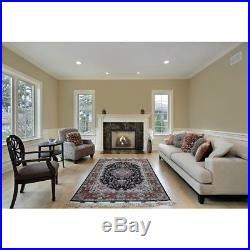 The seller is “smart.homes” and is located in Multiple Locations. This item can be shipped to United States, Canada, United Kingdom, Denmark, Romania, Slovakia, Bulgaria, Czech republic, Finland, Hungary, Latvia, Lithuania, Malta, Estonia, Australia, Greece, Portugal, Cyprus, Slovenia, Japan, China, Sweden, South Korea, Indonesia, Taiwan, South africa, Thailand, Belgium, France, Hong Kong, Ireland, Netherlands, Poland, Spain, Italy, Germany, Austria, Bahamas, Israel, Mexico, New Zealand, Philippines, Singapore, Switzerland, Norway, Saudi arabia, Ukraine, United arab emirates, Qatar, Kuwait, Bahrain, Croatia, Malaysia, Brazil, Chile, Colombia, Costa rica, Dominican republic, Panama, Trinidad and tobago, Guatemala, El salvador, Honduras, Jamaica, Viet nam, Uruguay.